On the workbench, Wallerawang West signal box in a nearly completed state. 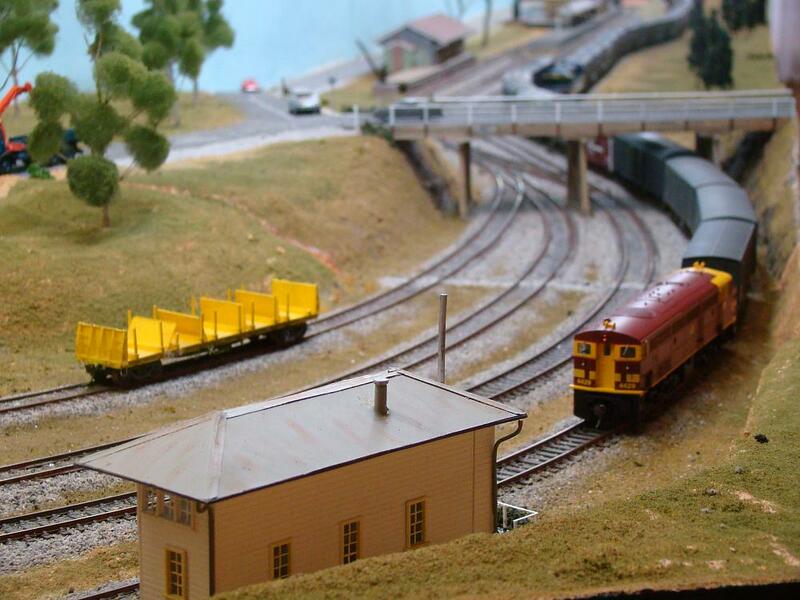 After a welcome break from construction on the layout, activity again got underway in late January 2010. The first project was to construct cyclone fencing to enclose the yards for the industrial buildings located on the eastern approach to the town. The fences are scratchbuilt from tulle (a very fine netting commonly used for veils and gowns) and square chicken wire, superglued together then painted silver. The month of February saw construction begin on the signal box at the western end of Wallerawang, just past the road overbridge and adjacent to the turnouts for the branchline to Mudgee. This signal box is often referred to as West Box. 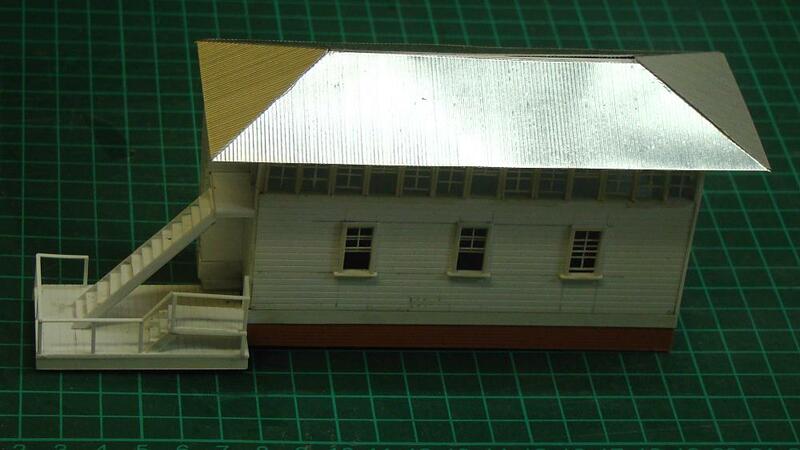 Plans were drawn up on CAD based on standard NSW signal box designs and photographs of the actual building. This was then printed out at HO scale to make construction easier. We decided to use styrene to model this structure, mainly due to its strength, speed of construction and durability. With West Box being located quite close to the front of the layout sturdiness of the model is important. We used Evergreen scribed styrene sheet to represent the weatherboard cladding. Micro Engineering windows were used for all of the windows, being suitably modified to better represent the prototype - horizontal sliding windows for the first floor windows and double hung windows elsewhere. The completed signal box in position on the layout, to the west of the station on the Down main. For the brick base we used Slaters embossed brick sheet. The roof was formed up with plain styrene, and then covered with AR Kits corrugated iron attached with contact adhesive. The stairs were built from Evergreen styrene strips, and the decking at the base of the structure uses both scribed and strip styrene. The signal box as seen from the front of the layout, here on display at the Friends of Linnwood Open Day held at Guildford in March 2010. 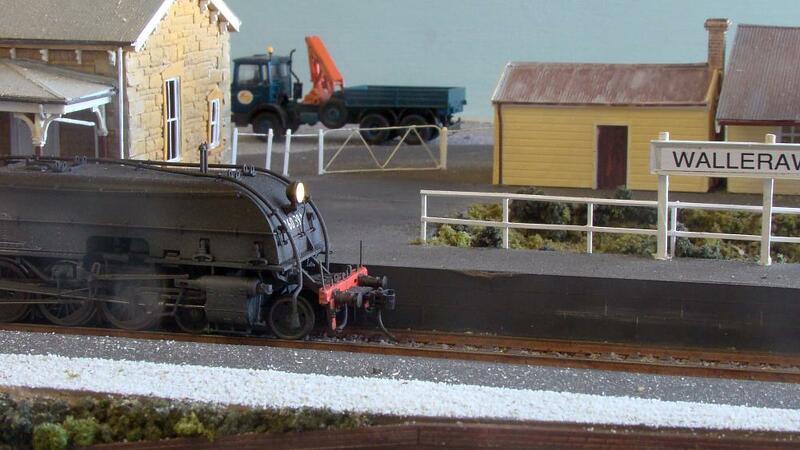 March gave us the opportunity to run the layout for a second time at the Friends of Linnwood Open Day, a regular one-day event organised to raise awareness of the historic Linnwood House, located in Guildford. Attention also turned to the front of the layout, where work started on the fencing along the main street. The same tulle and chicken wire construction method is used, with some vertical poles left longer in order to anchor the fence into the layout. 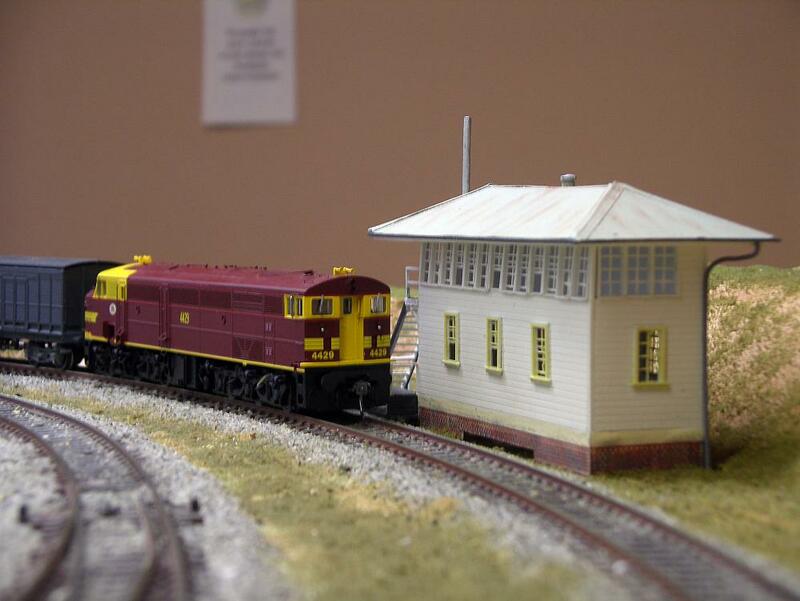 The Traffic Inspectors Office was scratchbuilt and added to the Up platform, as well as the adjacent white fence and gate. Garratt locomotive 6039 sits at the Up platform. The newly added Traffic Inspectors Office, white fence, and gate can be seen to the left of the station name sign.